So You Think You Know Magic? For several years we have been restocking, and after endless refreshes and refreshes and refreshes, and... well, you get the idea, we got bored and decided to make some restocking questions. At first, it started off as a joke, but then, the questions actually seemed to require some knowledge. This quiz is NOT intended for new restockers. In fact, it is designed for more experienced restockers, focusing on one of the most popular shops, Kauvara’s Magic Shop. You may recognize this shop whenever you go to the bank and see that mysterious link. You may have even walked in on a morphing potion. How exciting is that?! Well, the 15 questions in this quiz range from simple mathematics to an understanding of restocking, rarities, prices, and items. And yes, some questions are very specific and require experience. This quiz was developed to teach some fun tidbits and show how complex restocking can be in the infamous Kauvara’s Magic Shop. 1. You see a morphing potion stock for 26,286 NP, what is the BEST haggle to use? 2. Which of the following about haggling is FALSE? a. Alternating, repeating, and row haggling are all forms of haggling. b. The more expensive an item stocks for, the more you can overhaggle. c. Fast haggles are important in restocking. d. Mishaggling only results from overhaggling. e. Haggles can be done on the number pad or number row. 3. What is the highest rarity that 1 month old accounts can see? 4. A shop currently has 2 rows completely full. How many different items can stock? a. 3 rows of items. e. None, the shop is full. 5. What is INCORRECT about Kauvara's Magic Shop? a. Kauvara is the shopkeeper and is female. b. The shop is also known as #2.
c. The Neopian Bank has a link to this shop. d. 4 digit haggles are uncommon, but 7 digit haggles are very common. e. 4 digit haggles are uncommon, but 5 digit haggles are very common. 6. Which of the following about unbuyables (UBs) is TRUE? a. UBs are bought in Neopian shops and sold in user shops for over 100k. b. UBs can only be sold through the Trading Post. c. Green Uni Morphing Potion is an example of a UB. d. UBs are any item worth over 100k. e. Answers a and b are true. 7. Magic currently has 3 rows completely full. A restocker decides to entirely clear out 5 different items. The shop then stocks new items: 5 Novas, 2 Bottled Earth Faeries, 1 Green Uni Morphing Potion, 1 Juicy Elixir, and 2 Steam Jugs. How many more different items can stock? a. 1 row of items. d. 2 columns of items. 8. Which of the following is TRUE about morphing potions? a. There is at least one type of morphing potion that does not work. b. Most morphing potions stock over 10k but never over 1m. c. Morphing potions are always over r95. 9. Which of the following about Draik Morphing Potions (DMPs) is CORRECT? a. All existing DMPs stock in Kauvara's Magic Shop. b. All of the basic coloured DMPs stock over 100k. c. Darigan, Faerie, and Pirate DMPs stock for over 100,000 NP. d. Pirate DMPs are an example of a r99 DMP. e. Purple, Fire, and Skunk DMPs stock in the 15,000-30,000 NP range. 10. Which of the following about Krawk Morphing Potions (KMPs) is INCORRECT? a. All of the basic coloured KMPs stock for around 20k-30k. b. Two of the basic coloured KMPs are r98 and the other two are r99. c. At least two KMPs require six to seven digit haggles. d. Of the existing KMPs, at least 3 are r98 and therefore appear as search results. a. Darigan Draik Morphing Potion. b. Plushie Draik Morphing Potion. c. Plushie Jetsam Morphing Potion. d. Faerie Draik Morphing Potion. e. Plushie Chomby Morphing Potion. 12. Which of these morphing potions stock for OVER 100k? a. Darigan Zafara Morphing Potion. b. Green Draik Morphing Potion. c. Plushie Techo Morphing Potion. d. Plushie Korbat Morphing Potion. a. Rainbow Chomby Morphing Potion for 98789 NP. b. Ghost Draik Morphing Potion for 89789 NP. c. Plushie Chomby Morphing Potion for 456565 NP. d. Red Krawk Morphing Potion for 56456 NP. e. Fire Draik Morphing Potion for 23123 NP. a. Rainbow Chomby Morphing Potion for 45656 NP. b. Pirate Draik Morphing Potion for 564565 NP. c. Lost Desert Krawk Morphing Potion for 456565 NP. d. Plushie Korbat Morphing Potion for 23123 NP. e. Plushie Jetsam Morphing Potion for 45656 NP. 15. Which of the following concerning Draik Morphing Potions (DMPs) and Krawk Morphing Potions (KMPs) is INCORRECT? a. Grey DMP and Darigan DMP are DMPs that stock around the 100k range. b. Camouflage KMP is a KMP that stocks for roughly the same range as Pirate DMPs. c. In increasing stock prices: Blue KMP, Pink DMP, Woodland DMP, Red DMP. d. In decreasing stock prices: Pirate KMP, Lost Desert KMP, Woodland DMP, Faerie DMP. e. Examples of r98 DMPs and KMPs are Pirate KMP, Woodland DMP, Red KMP, Faerie DMP. 1. a. is overhaggling too much. c. – e. are all very underhaggling. Thus b. is the BEST haggle. Note: overhaggling is recommended over underhaggling; underhaggling may result in the shopkeeper being greedy (ie. an item stocks for 26k and you offer 23123 but the shopkeeper thinks 24k is a fair deal). 2. a. is correct. Alternating = 12121. Repeating = 12222. Row = 12312.
b. is correct since you can barely overhaggle for an item worth 5k, but you can almost overhaggle by 200k for an item that stocks for 1m. c. is correct obviously. Haggling is very important in restocking. Don’t be slow! 3. b. R94 is correct. 4. Any given shop can stock 4 rows of items with 6 items in each row, giving a grand total of 4x6 = 24 different items. 2 rows = 12 items so 24-12=12 items can stock. Thus b. is CORRECT. 5. a. is correct (Kauvara is not a boy; don’t anger her or else no morphing potions will stock). e. is correct: majority of morphing potions stock from 10k-200k. d. is INCORRECT: very few morphing potions in Magic stock for 5k or 10k (potential 4 digit haggle) and 1m (7 digit haggle). Since the question asks for which option is incorrect, d. is the right answer. 6. a. is false, shops can only sell items up to 99,999 NP. b. is false, can be sold through auctions also. c. Green Uni MP is buyable (it’s junk also. Don’t buy this in magic). d. is TRUE. Unbuyable means it can’t be sold in shops (unless you want to, then it is a buyable UB... confusing right? Haha). e. well, a and b are false so... false. 7. 3 rows = 18 items. 18-5 = 13. 13 + 5 = 18. Hang on a second... this was the exact same amount we had to start with... !!! Thus, 6 items or 1 row of items. Therefore a. is CORRECT. 8. a. Stone Lupe Morphing Potion does not morph your pet into a Stone Lupe. I wonder why... ;) (neither does it stock). So a. is TRUE. b. Pirate Krawk Morphing Potion can stock for over 1m. c. Orange Koi Morphing Potion is r94. 9. a. Plushie Draik Morphing Potion does not stock (retired). b. All basic coloured DMPs stock for around 80k. c. Faerie DMP stock for around 70-80k. Pirate DMP is closer to 90k. d. Pirate DMP is a r98 DMP. b. is INCORRECT – only Red KMP is r98, Blue/Yellow/Green KMPs are r99. Because the question asks which is incorrect, option d. is the answer. c. is correct – Lost Desert KMP stocks for around 800k (6 digit haggle); Pirate KMP stocks for around 1m (6-7 digit haggles). d. is correct - Red KMP, Lost Desert KMP, Pirate KMP, and Camouflage KMP are all r98. 11. c. Plushie Jetsam MP stocks for the MOST NP (around 300-400k). Darigan DMP stocks for around 100k. Plushie DMP doesn’t stock. Faerie DMP stocks for 70-80k. Plushie Chomby MP stocks for around 20k. 12. d. Plushie Korbat MP stocks for OVER 100k (around 110k). Darigan Zafara MP stocks for around 80k. Green DMP stocks for around 80k also. Plushie Techo MP stocks for around 40k. 13. a. Rainbow Chomby stocks for around 30k. b. Ghost Draik stocks for around 20-30k. c. Plushie Chomby definitely is not over 400k (it stocks near 20k). d. Red Krawk stocks for around 20-30k. e. Fire Draik stocks for around 20k. Thus, e. is MOST PROBABLE. a. Rainbow Chomby normally stocks for around 30k = 15k. b. Pirate Draik normally stocks for around 90-100k = 45-50k. c. Lost Desert Krawk normally stocks for around 800k = 400k. Thus, c. is MOST PROBABLE. d. Plushie Korbat normally stocks for around 110k = 55k. e. Plushie Jetsam normally stocks for around 300-400k = 150-200k. 15. a. is correct. Darigan DMP stocks for near 100k. Grey DMP is slightly more, stocking for around 120-130k. b. is correct. Camouflage KMP stocks for around 90k and Pirate DMP is near 90k as well. c. is correct. Blue KMP = 20k, Pink DMP = 30k, Woodland DMP = 60k, Red DMP = 80k, therefore increasing. d. is INCORRECT. Pirate KMP = 1m, Lost Desert KMP = 800k, Woodland DMP = 60k, Faerie DMP = 70k, therefore not decreasing. Thank you for taking the time for doing this quiz. :) We hope it wasn’t TOO hard, but more importantly, we hope you learned at least a thing or two about restocking at Kauvara’s Magic Shop. Of course this won't enhance your performance in restocking; only practice and experience can do that. However, we do hope that this quiz has given you a good idea of the restocking basics, the basics of morphing potion and its stock prices, and the more in-depth information about Draik Morphing Potions and Krawk Morphing Potions since they are the most sought-out morphing potions. We wish you the best of luck in your endeavours in restocking in Kauvara’s Magic Shop and other shops. 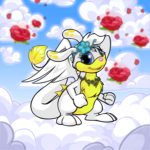 Restocking can sometimes be frustrating and boring, but it can also be very rewarding. Good luck!